Several months ago I came across a post from Less Than Perfect Life of Bliss, where she had made a skirt from a man's dress shirt. I was intrigued. 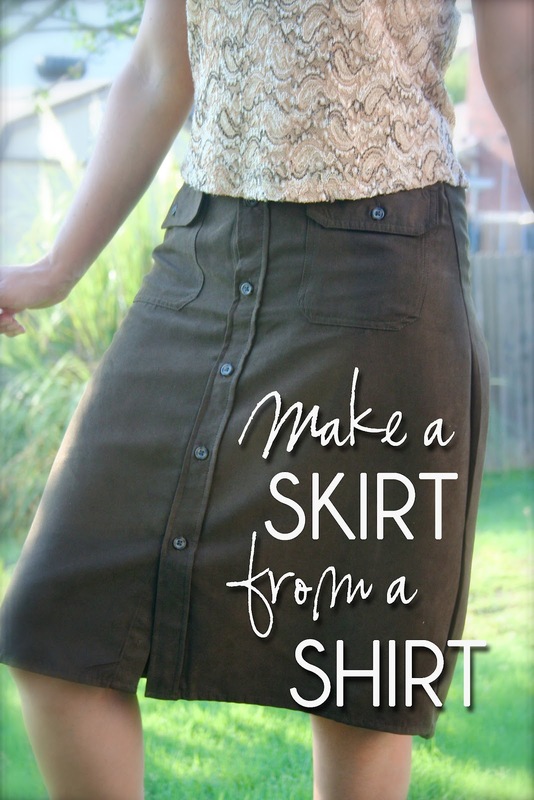 I wanted to try it but it took me a long time to find a shirt that I liked, my husband didn't have any extra I could use, and I also wanted it to be cheap, because I had no idea how it would turn out. I took pictures along the way in case you too would like to try this wonderful transformation yourself. One little tip before we begin---if you have hips, and yes, I do, buy at least an extra large mens shirt. I purchased a large and just barely squeezed into the skirt. A good thing to do would be to measure the distance about an inch in from sleeve to sleeve (across the chest of the shirt) and make sure that it is at least half the circumference of your hips. :0) Lesson learned! Ok, so first, cut off the sleeves, the thick seam of the sleeve goes too. Cut right before that. 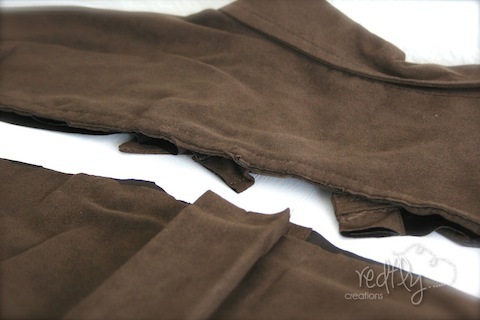 Next, cut off the top of the shirt, right below the seam. Depending on your waist size (without the pleat the waist is quite large) pin the pleat in place right now before you stretch out the shirt. This will help the back of the waist not to gap. 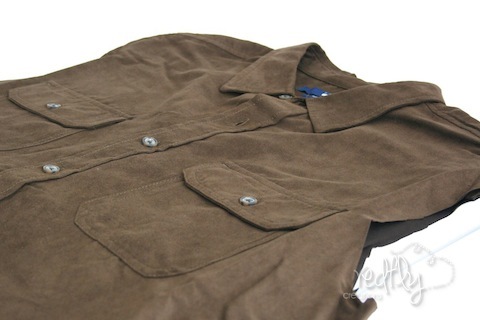 Next, put the shirt on inside out with the pockets in the front. 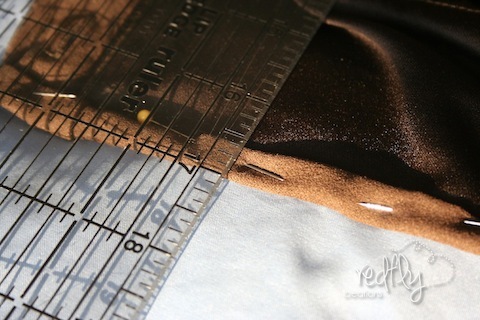 Pin down the sides-where the sleeves used to be--with about a 1/2" space for your seam. See how I didn't have much room for a seam on my hip there? A larger shirt would've made that seam a little more roomy. 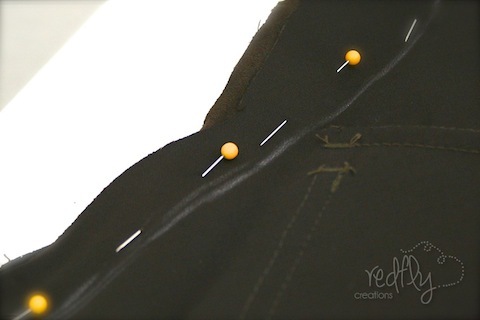 Then, take a white crayon and draw a line along the pins. The straighter the better. If your line is too curvy it will make the seam "puckery". 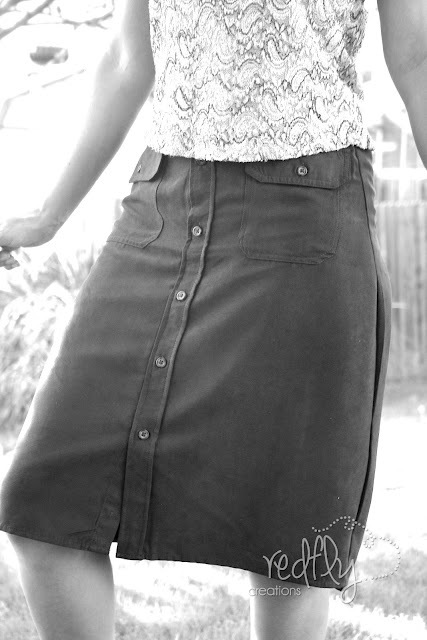 Sew down the white line you drew, and continue parallel all the way to the end of the skirt. Do the same to the other side. Try it on and make sure you don't need to make any adjustments. Then it is time to hem the waist band. 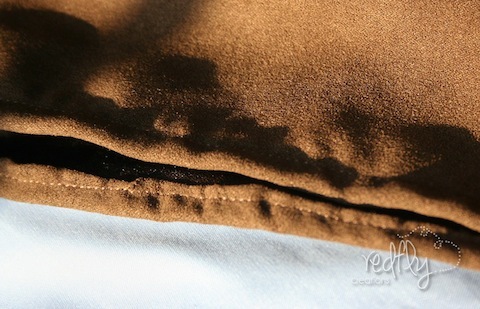 I simply folded down the fabric once, then a second time with a small 1/2" fold, and pinned it. Nothing too fancy. Then I sewed the hem close to the bottom of the fold. If you sew it close to the top of the fold you are bound to miss some of the fabric that was turned under and it will come unraveled. I actually did not hem the bottom of the skirt, because by the time I got it pulled up high enough so that it fit over my hips, the length was just perfect. 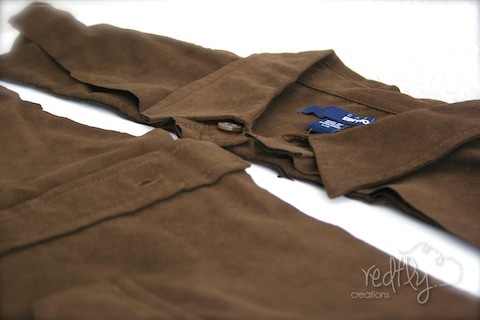 However, if you get the right size shirt, you may want to hem up the bottom a little bit. This last step you don't have to do, but I personally feel more comfortable with it. 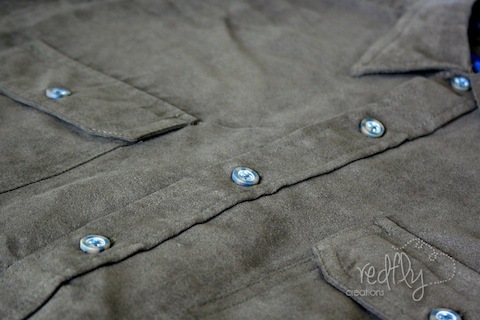 I sewed down from second button to right below the final button, right on the seam, so that in between the buttons it wouldn't gap. There she is. My new skirt from a man's dress shirt. I will now be looking at men's dress shirts in a whole different light! Thank you Mari! Thank you for stopping by and for the sweet compliment. I checked out your online magazine. You do a really good job with it. I love all your contributing writers! I am a huge fan of anything that involves recycling, thanks for sharing! So nice... Awesome idea. Liked the way you have customized it. Thanks for sharing. This looks great!! TFS!! 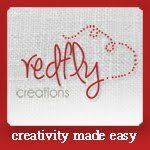 Stopping by from Craft-O-Maniac linky party and your newest follower. Thank you so much for doing this tutorial. It is wonderful. I now have an up-cycled Hawaiian skirt that fits perfectly! That's great! I love the idea of using a Hawaiian shirt! Thanks for sharing! I'm going to raid my hubby's closet... He just doesn't know it yet! Love this. Liked the way you have customized it. Thanks for sharing. What if you keep the sleeves as an accessory, like a belt that ties in front or back? 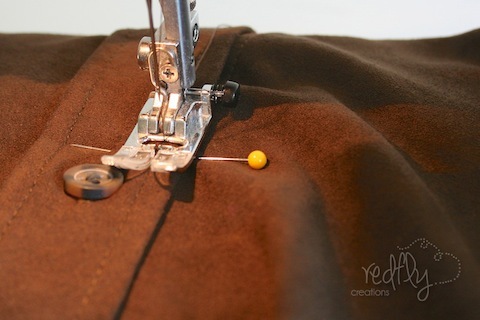 They could probably be sewn in place without getting in the way of the buttons; which you need to in order to unbutton the shirt/skirt to take it off. Might look better if the cuffs were cut off first, then sewn closed? Ohh es genial. Voy a buscar una camisa para hacerme mi falda. Great tutorial! I made one out of a lightweight Hawaiian shirt, but instead of cutting off the short sleeves, I turned them in and made them pockets, Topstitching the front crease and sewing the bottom closed did the trick. 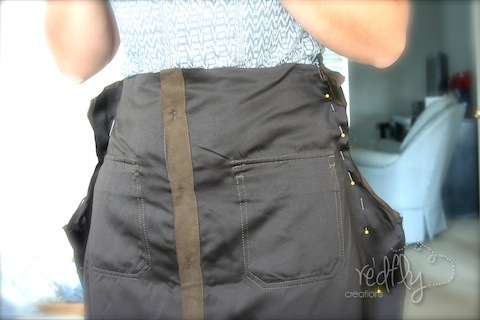 If the pocket starts to roll out, just tack or sew down onto the front of the shirt.